What began in 1984 as a campground ministry has grown to include a disaster relief ministry and a thrift store ministry. RUSTON – What began in 1984 as a campground ministry has grown to include a disaster relief ministry and a thrift store ministry. This is the story of Rolling Hills Ministries. The thrift store opened in 2003 as a way of providing some income for the disaster relief ministry, which has grown to the point that it is now one of the largest non-state convention DR units among the 1,500 units in the Southern Baptist Convention. The three ministries function independently of each other, yet remain interdependent, Abernathy said. Each year, between the first Sunday in April and the last Sunday in October, Southern Baptists minister in a variety of ways to people vacationing in four state parks: Lake Claiborne, Jimmy Davis, Lake D’Arbonne and Lake Bisteneau. Volunteers – mostly from Southern Baptist churches in the area of each of the state parks – provide Family Nights, Day Camps, Saturday visitation and Sunday services. Depending on availability of volunteers, Family Nights might involve watermelon, puppets, singing or a variety of entertainment. Leaflets passed out say the activity is sponsored by Louisiana Southern Baptists. 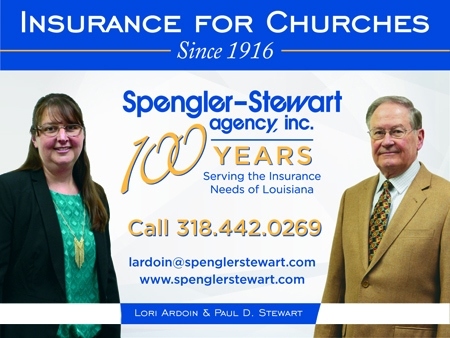 It is a ministry supported in part with Louisiana Cooperative Program dollars. Volunteers engage vacationers in conversations designed to open spiritual doors for those whose hearts have been prepared by the Holy Spirit. Tracts, New Testaments and Bibles – in a variety of languages – are available for those who request them. Day Camps, which take place during June and July, are offered weekdays two or three days a week. These engage elementary school-age youngsters for several hours, which enable their parents to relax and enjoy the wonder of God’s creation. On Saturday, volunteers visit each of the campsites in the four parks, to engage vacationers in conversation and to invite them to a 30-minute Sunday morning worship service. Permission must be obtained from the Office of State Parks to be a campground host. Rolling Hills has developed a reputation with that department for working within guidelines, so they are given permission each year to be a host. Individual churches that apply might not be given such ready approval, Abernathy said. The worship services – which might draw five people or 75 – are in an outdoor setting, perhaps in an open-air pavilion or around picnic tables. People are invited to bring their own lawn chairs. One man came to a Sunday worship service because his kids had had such a good time during day camp the previous week, Abernathy said the man told him. “He’s an example of the men who’d never darken the door of a church, but who would be willing to sit in their own lawn chair at a state park and listen to a message from God’s word. Tommy and Mary Ann Mellinger were appointed in the early 1980s by what then was the Southern Baptist Convention’s Home Mission Board to start resort missions in Lake Claiborne and Lake D’Arbonne State Parks. After perhaps three years, they moved to a new assignment and the ministry languished. Kenneth Everett, an area director of missions at the time, asked Abernathy a year later to essentially restart the ministry, which since has grown to four state parks – keeping the name that was already known to state park officials. 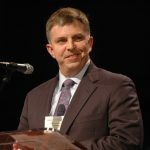 Abernathy, native to Ruston, had a bachelor’s degree in forestry, and an understanding that God was calling him into student ministry. 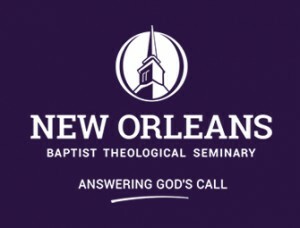 Subsequent masters degrees – divinity (1989) and Christian Education (1990) – at New Orleans Baptist Theological Seminary – provided him with an academic background but his real education has been on-the-job training, Abernathy said with a grin. Rolling Hills didn’t respond as a ministry to the Arcadia tornado, but seeing Southern Baptist response to the event got them interested in disaster relief, the director said. Rolling Hills’ feeding unit’s first DR response was to Broussard after Tropical Storm Allison in 2001. About 50 people in all responded over the next 10 days to the need. “Our first activation we cooked over 9,000 meals total, and we thought that was a big deal,” Abernathy said. Five teams went to New York City after Sept. 11, 2001, to assist the American Red Cross and Salvation Army feeding and clean-up units. They were at Ground Zero for five weeks over a several-month period. Rolling Hills’ DR feeding unit was called out to assist after the Lili and Isadore storms in Houma in 2002. They prepared 101,000 meals during that activation. In 2004, they were called out to Alabama and Florida for hurricane relief. In 2005, Rolling Hills’ chain saw unit responded in the spring to the Fryeburg, La., tornado, and after Hurricanes Katrina and Rita, the feeding unit responded to Hammond, Baton Rouge and Leesville, where they prepared 226,000 meals. They were not called out in 2006, but in 2007 they responded to a train derailment in Choudrant. In 2008, Rolling Hills went to Lafayette after Hurricane Gustav, and to Sulphur after Hurricane Ike. “We’re now rated as a 25,000-meal [per day] unit,” Abernathy said. “We have trained over 800 people; 600 are still in the system.” About 600 people are expected to participate in Rolling Hills upcoming roundtable training event Feb. 20-21 at Temple Baptist in Ruston. For more information about it, and to register, call 318.251.0065 or email rollinghills33@bellsouth.net. “It takes several thousand people trained to make this work,” Abernathy said. Gibbie McMillan, Louisiana Baptist Convention Disaster Relief director, concurred. 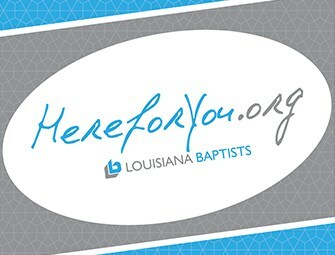 His office has to call eight to twelve people to get one “yes” each time there is a need for DR volunteers, McMillan said in a recent article in the Louisiana Baptist Message. Training at Rolling Hills next month is to include Basic Disaster Relief, Yellow Cap Feeding, Yellow Cap Chain Saw, Bobcat Operation and Safety Techniques (limited to first 25), Shower Unit, Ham Radio Technician Test (if enough interest) and Water Purification. Reservations are required. Disaster Relief training also is to be offered at Camp Living Waters near Loranger Jan. 23-24, and at First Baptist Church in Bossier City on Feb. 28. Abernathy is a White Cap and national incident commander with the SBC’s NAMB Disaster Relief center. As such, in 2008 he helped with the SBC’s Disaster Relief response in Iowa, Georgia and Louisiana. In the summer of 2001, Abernathy and his wife Jerri – they’ve been married 16 years and have three children – attended a resort ministry conference, where she heard about a thrift store that helped support a resort ministry. Then came 9/11; the Rolling Hills unit didn’t return home until Christmas week, only to find Abernathy’s mother quite ill. In February, Abernathy got what he thought was the flu, but grew so much sicker so fast that they began talking about funeral arrangements. During his Saturday morning surgery, scores of people lining the Glenwood Medical Center Hospital in West Monroe hospital corridor prayed, as did the surgeon, Dr. Ferguson, who was known as “the praying surgeon.” He drained all the abscesses he could get to, and that was enough. By April, Abernathy was preaching again, his liver completely healed. “What I learned from that is that if God’s got something for you to do, you better do it today,” Abernathy said. “We’re not guaranteed tomorrow. And I learned what’s important is your relationship with your Lord and your family and friends. Rolling Hills Ministry spent a year planning for the opening of a thrift store, and gathering items for initial sale in it. The first two acres on a state highway three miles north of Ruston were donated; the ministry bought six adjacent acres. The original building was 7,000 square feet; a year later, 3,000 square feet were added to the back. He’s not had any training in thrift stores, or even read any “how-to” books on the subject, but has merely applied common sense, Abernathy said. Everything comes in the back of the building, where it is color-tagged at “full price,” which is, for example, $2 for shoes of any size or style, $3.75 for coats or jackets, $1 for videos and DVDs. Items include anything that might go in a home, from clothing to collectibles, drapes to mops, children’s toys to family games. A month later, everything in that color tag is reduced by 25 cents each week for the next month. If it doesn’t sell within two months after being on the shelves or hanging from the racks, it is packed up and sent elsewhere. It’s a revolving system, with four colors of tags rotating over an eight-month period. One man with a “pastor” air about him tried on several suit jackets on the day the Message was there. The clothing is not washed before being sold. If it doesn’t meet quality standards, it doesn’t go on the rack. Every six weeks, Rolling Hills sends seven ton of unsold items to ministry outlets in third-world situations, shipped through a charitable organization in Texas and elsewhere. While the thrift store doesn’t fully fund the disaster relief ministry (the resort ministry needs no more funding than what the local churches provide as they minister in the parks), it has enabled the purchase of equipment, such as two one-ton trucks, bob cat, convection ovens and more. A successful thrift store requires two things, Abernathy said: building relationships throughout the community – with donors, customers and workers – and a commitment to be in the ministry long-term. And the people who come into the store need to feel that they are in a retail establishment, one that has good organization, no clutter, and no offending – musty, dirty – odors. In addition, it needs to be an enjoyable atmosphere for the customers and the workers. Rolling Hills Ministries Thrift Store today is open from 8:30 a.m. to 5 p.m. Monday through Friday, and 8:30 a.m. to 1 p.m. on Saturday. Saturday mornings are usually the busiest time of the week. 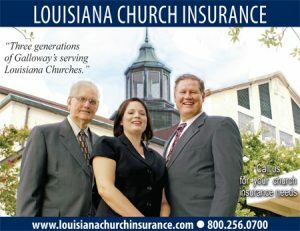 Rolling Hills Ministries is governed by a 24-person board of trustees – four from each of the four associations in its part of northern Louisiana: Concord-Union, Webster-Claiborne, Jackson, and Bienville Baptist Associations – six ‘at large’ members and each of the associations’ directors of missions. Five full-time employees and nine part-time employees are augmented by dozens of regular volunteers and hundreds of occasional ones, such as the GAs who come in as a mission project and sort clothes. Next summer the store will be a NAMB Families On Mission worksite. Jean Kennedy, a member at Emmanuel Baptist in Ruston, has been a volunteer since before the store opened. Philip Washington, a member of Temple Baptist in Ruston, has been volunteering for about six years. Eddie Grafton, a member of Temple Baptist in Ruston and newly retired, started a week before he was interviewed by the Message. Abernathy nodded as he listened to what his volunteers had said. Chris Albritton, full-time since May 2007 as Ministry Coordinator, started in January 2006 as a part-time college student. Bobbie Nolan, a member at First Farmerville, was one of many donors on the day the Message visited the Rolling Hills Thrift Store.